Recently, I got a huge download about feeling anxious: I realized that my anxiety is trying to help me. I know its weird for me to say that. If you ever feel anxious, you know anxiety does not feel helpful. Anxiety feels like something that needs to be stopped, exited, or numbed out. Sometimes anxiety is there because something is deeply, truly, wrong. Sometimes its there to save our life. Sometimes, once it starts, it doesn’t let up, and we need professional help to recalibrate our nervous system. I am talking in this post about low grade anxiety, a physical and mental experience of being unsettled and uncertain. Sometimes this anxiety shows up as doubt, second guessing, excessive planning, over thinking. Its the stuff that keeps you up at night, and then in the morning, has gone. This anxiety is transient, and is mostly just annoying and inconvenient. But anxiety is trying to tell us SOMETHING, like all of our feelings and experiences are. And in the case of mild anxiety, where you know there is no immediate threat to your safety or well being, the difficulty is in determining exactly what its message is. There are lots of ways we can learn to cope with anxiety: through yoga, meditation, acupuncture, energy work, time in nature, connection with loved ones, exercise, rest, nourishing meals, reducing stress, getting enough sleep, and more. But, if I am still trying to just get rid of feelings of anxiety, then I still have a problem. I am missing one of the main reasons we have feelings to begin with: emotions give us valuable information about ourselves. So, another way to work with our anxiety, that doesn’t involve a whole lifestyle transformation, is learning to decipher its message. My husband and I had planned an overnight away this past weekend while my parents were in town, and it meant we would miss our weekly Family Nature Group excursion. The group planned to summit Green Mountain that morning, a nearby mountain peak that would only entail a 2 1/2 mild round trip hike (we live in Boulder, Colorado so this is a pretty typical weekend activity). It would be my seven year old son’s first climb to a summit, and he didn’t want to miss it. Another father agreed to take our child with his family, and be responsible for him that day. That would enable my husband and I to have a leisurely morning together: something we never have together as parents of young children. Well. I woke up in the middle of the night worrying about our plan. The trail is snowy and slippery, with a decent amount of exposure, is at a higher altitude, and this father looking after our son has two other children of his own to care for. What if our son gets overwhelmed, hurt, or worse? I could hardly get any sleep once my mind started worrying. I did everything I know how to do when anxiety hits: I tried to relax through breathing and meditation, I visualized the event going smoothly and safely, I even envisioned my son surrounded in white light. I got up and walked around, I kept resetting my nervous system with breathing and body scans. I tried to reason with myself: my son was in good hands and wasn’t in any real danger. The risks were the same as when I take the kids hiking. I did everything I knew. My husband woke and Iistened as explained what was happening. I told him while I knew the plan was reasonable, for some reason I felt anxious about it. As we talked, we both decided to come home a few hours earlier so my husband could meet up with the hiking group before they reached the summit. I felt better about this plan, but I wondered if we were going through a lot of trouble just to accommodate my anxiousness, which is not how I want to parent. Maybe my anxiety had gotten the best of me this time. Later that day, about noon, a photo text came in from my husband. It was him and our son on the summit. Together. I immediately started to cry as I finally understood why I felt anxious. It wasn’t really about my son’s safety, although of course that matters to me. It also wasn’t because I worry too much or am over protective—two negative projections mothers get all the time. 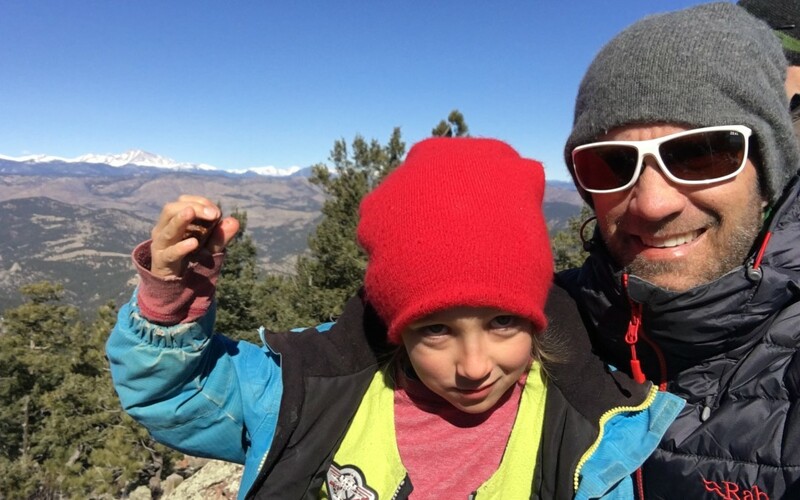 I was anxious because climbing a mountain is a big deal, a memorable moment in my son’s life, and I wanted one of us to be there with him as he did it. When I saw the selfie of the two of them, I knew why I couldn’t “just get over” my anxiousness last night. I knew why I would sacrifice a few precious hours with my husband, so that he could run and catch up with our son. It all made perfect sense now. My anxiety was pointing me toward a deep value that I hold: being present for my children. Being there for our children’s transitions, accomplishments, challenges, and triumphs is of huge importance to me. My anxious feelings were directing me toward taking action that would support my priorities and help me feel more congruent and aligned. I felt grateful to my husband for trusting me even though at the time all I could articulate was, “I’m anxious about this.” My reasons didn’t have much rationale to back them up, and still he listened. He didn’t roll his eyes, or tell me I was “overreacting.” He also realized as he caught up to the group right before the summit that he too felt it was important for one of us to be there. What if I always considered my feelings from the view that they are trying to point me toward what I care about most? Instead of downplaying my feelings (I have a LOT of feelings), or subordinating to society’s messages about how I should mother, what if I always took the time to slow down, listen, and reflect on what might be trying to break through into my consciousness? Right now, I feel grateful for my anxious feelings (even though I still find them really uncomfortable). They have led me towards all kinds of practices and ways of living that enhance my awareness, health, and capacity to be of service in the world. Anxiety, when interpreted accurately, can also point me in the direction of my values, of my deeply personal priorities and needs. Anxiety can help me be true to myself and take action on what is really most important to me. Anxiety, you are disruptive, uncomfortable, and a crude alarm system. You are annoying as hell. But when I see you as a messenger, instead of an obstacle, I can work with you.